The Tempo Tread Watch features stainless steel links that can be equipped with interchangeable tools, similar to the existing Leatherman Tread bands. 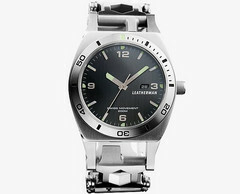 This timepiece would be Leatherman's first watch and is scheduled to hit the market in November. Back in 2015, Leatherman introduced the Tread line of products that brings a customizable set of tools in a convenient wrist band. Now, the leader of the US multi-tool market takes one more step forward and announces its first timepiece, a watch that uses the Tread band and is simply called Tempo Tread Watch. While most of the specs are not public yet, we know that the Leatherman Tempo Tread Watch has glow-in-the-dark hands and markers, is protected by a sapphire crystal shield, and is able to handle water down to a depth of 200 meters. Users of the existing Tread band will be able to add their tools to the watch since the Tempo Tread Watch is TSA-friendly. Although it does not come cheap, the US$575 Leatherman Tread Watch has six links with various tools in the retail package. Unfortunately, it will only become available for purchase in November.